Prime Minister Narendra Modi and his Japanese counterpart Shinzo Abe Monday held 'fruitful and extensive' talks during which they discussed issues of bilateral interest, the situation in the Indo-Pacific region and threats posed by nuclear terrorism as the two sides signed several agreements including on a high speed rail project and naval cooperation. The two leaders also agreed to initiate 2+2 dialogue involving their foreign and defence ministers. India has a similar agreement with the United States and the two sides held the first round of 2+2 dialogue in New Delhi last month. 'Held fruitful and extensive talks with PM @AbeShinzo. Today's discussions focused on aspects relating to better economic ties, stronger cooperation in areas of defence and security,' Modi tweeted after two days of summit-level talks. During the 13th annual summit, the two prime ministers reviewed developments in bilateral relations and explored new areas of cooperation, focusing on shared vision for peace and prosperity in the Indo-Pacific, where China is flexing its muscles. China claims almost all of the South China Sea and also laid claims on the Senkaku islands under the control of Japan in the East China Sea. Chinese ships routinely patrol around the Senkaku Islands. China has resorted to aggressive patrols in the last few years. Vietnam, the Philippines, Malaysia, Brunei and Taiwan have counter claims over the South China Sea. Abe hosted Modi days after he went to Beijing where held talks with Chinese Premier Li Keqiang and President Xi Jinping. Abe's visit -- the first by any Japanese prime minister since 2011 -- was aimed at repairing ties that have been riven by disputes over territory, military expansion in the Pacific and World War II history. Modi and Abe agreed that India and Japan must work together for a rules-based and inclusive world order that fosters trust and confidence by enhancing communication and connectivity to ensure rule of law, unimpeded trade and flow of people, technology and ideas for shared prosperity. "The two leaders' vision for the Indo-Pacific is based on a rules-based order that respects sovereignty and territorial integrity of nations, ensures freedom of navigation and overflight as well as unimpeded lawful commerce, and seeks peaceful resolution of disputes...without resorting to threat or use of force," said the India-Japan Vision Statement issued after the talks. "We both agree that from digital partnership to cyber space, from health to protection, and from sea to space, in every field we will strengthen our partnership," Prime Minister Modi said. 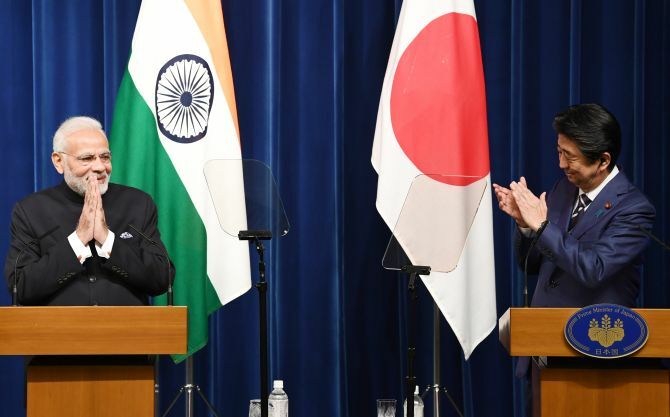 Prime Minister Modi expressed his appreciation for the significant contribution of Japan's Overseas Development Assistance to the socio-economic development of India. He appreciated Japan's role in promoting connectivity through quality infrastructure projects such as the Western Dedicated Freight Corridor and the Delhi-Mumbai Industrial Corridor. "The two leaders reaffirmed their shared commitment to the total elimination of nuclear weapons and remained resolute in the task of strengthening international cooperation to address the challenges of nuclear proliferation and nuclear terrorism," the Vision Statement said. They condemned in the strongest terms the growing threat of terrorism and its universal reach. The two leaders called upon all countries to work towards rooting out terrorist safe havens and infrastructure, disrupting terrorist networks and financing channels, and halting cross-border movement of terrorists. They underlined the need for all countries to ensure that their territory is not used to launch terrorist attacks on other countries, in an apparent reference to Pakistan which is accused by its neighbours of providing safe havens to terrorists. "They called upon Pakistan to bring to justice the perpetrators of terrorist attacks, including those of November 2008 in Mumbai and January 2016 in Pathankot. "They looked forward to strengthening cooperation against terrorist threats from groups including Al-Qaida, ISIS, Jaish-e-Mohammad, Lakshar-e-Tayyiba, and their affiliates," the statement said. After India's full accession to three international export control regimes, the two leaders pledged to continue working together for India's membership of the Nuclear Suppliers Group, with the aim of strengthening the global non-proliferation efforts.